EKO will display new acoustic and electric guitars part of the catalogue. Don’t miss the chance to try them out! The EKO ONE series is the perfect trait-d'union to learn how to play guitar in a comfortable way and also to play live. The Series includes Dreadnought, Dreadnought cutaway and the very popular EKO 018 American Cutaway shapes. All Cutaways models are fitted with Fishman Isys Preamp with onboard tuner, definitely a high-quality equalization solution for this range of product. All guitars come in a high gloss finish and are available in natural colour and also in a beautiful vintage burst color. An elegant logo at the 12th fret and head plate décor, along with a beautiful spruce top and mahogany back and sides, both in a shiny gloss finish, make it a really joy to look at these instruments. The choice of mahogany wood for the neck and of South American Roupana wood for the fretboard and the bridge, increase even further the appearance and make touching this instrument a great experience, thanks also to the ABS binding with “radius” for very smooth corners. No compromise on the preamp choice, the guitar comes fitted with the well-known Fishman Isys 301, with onboard tuner. Definitely a series of guitars that will please eyes, ears and hands. The EKO ONE ST series is the perfect trait-d'union to learn how to play guitar in a comfortable way and also to play live. The Series includes the very popular EKO 018 American Cutaway shapes and the EKO Nylon shape. All models are fitted with Fishman Isys Preamp with onboard tuner, definitely a high-quality equalization solution for this range of product. All guitars come in a high gloss finish and are available in natural colour and also in a beautiful vintage burst color. An elegant logo at the 12th fret and head plate décor, along with a beautiful solid sitka spruce top and “ETS mahogany” back and sides, both in a shiny gloss finish, make it a really joy to look at this instrument. The choice of mahogany wood for the neck and of South American Roupana wood for the fretboard and the bridge, increase even further the appearance and make touching this instrument a great experience, thanks also to the ABS binding with “radius” for very smooth corners. A inhouse developed treatment of the mahogany wood used for the back and sides, the EKO ETS treatment, extends the response of the low frequencies by keeping the fast response typical of mahogany, on top of that the darker tone the ETS treatment confers to the wood increases even further the elegance of the instrument. Definitely a guitar that will please eyes, ears and hands. A no-compromise, all solid series, based on a selection of woods sourced from all over the world. WOW, the Wood Of the World Series, represents the top of the range of the EKO catalogue. Every single guitar is unique and every single wood part is selected among a wide list of precious woods like Cocobolo, Padouk, Koa, Ebony, Koa and others. Master Luthier, Roberto Fontanot, is hand selecting and matching all tops and back sides to create masterpieces for the joy of the player. Different woods used on the back and sides confer to the guitar completely different characteristics in terms of tone and sound. Every single WOW guitar then shares features that are the same for all, like the Italian Spruce Top, carefully selected and sourced from a region of the Italian Alps, very well known for offering Spruce wood for the best violins in the world, only a limited number of manufacturer can access the woods of this private reserve. The shape of the WOW guitar is based on the EKO 018 design, very compact dimensions with a reduced depth, in order to produce a fast sound with immediate response, without too much bass frequencies. Nut and Saddle have all the same size and are all made with BONE. Butterbean machine heads, in Gold or Chrome finish, based on the best match with the back and sides. EKO design for Bridge and Headstock. A tribute to the world famous poem “Infinito” written by Giacomo Leopardi, an Italian philosopher and poet born in Recanati, widely seen as one of the most challenging thinkers of the 19th century. This instrument introduces important elements of innovation in combination with highly selected and quality woods aiming at a no compromise sounding and aesthetically amazing instrument. The weight of the instrument, sought through a careful selection of materials, is surprising in terms of lightness and lightness is also understood as sobriety of aesthetics and typical Italian style. The research and the treatment of the materials, to reduce the weight, is all in favour of the sound that is "free", the instrument does not include any metal parts, that not only would increase the weight, but that also would create elements of sound cushioning. The Solid Top Wood is Genuine Italian spruce from the Alps, fingerboard and bridge are in National Walnut; the neck is made of Okoumè, a wood from the Mahogany family that stands out for its extreme lightness, sound characteristics and beautiful veins that treated with specific anilines make the neck of the INFINITO beautiful. For the back and sides Ovangkol wood, also treated with aniline to embellish and deepen the veins, typical of this exotic wood. National Walnut wood and Mother-of-Pearl are mixed and interweaved to represent the link between Eko and Recanati and drawing the INFINITY symbol. Underlining even more the level of innovations this guitar is introducing by eliminating all metal parts, the stability and lightness are supported also by the use of Carbon Fiber elements. Three anti-torsion carbon fiber bars, calibrated with different thicknesses are placed inside the neck for stability of neck and fingerboard and Carbon Fiber machines to allow for a very careful tuning, thanks to the very precise ratio of 21:1, and offer a great feeling of the headstock which has almost no weight; the 6 carbon fiber machines have the same weight a single standard metal machine has. To complete also nut and saddle are made of Carbon Fiber. A solid wood electric hollow body made light by using Swamp Ash wood, combined with a flamed maple top and a mahogany neck. The fingerboard is made of South American RoupanÃ , the wood that EKO has chosen instead of Rosewood to sustain the worldwide campaign to limit the use of protected wood species. The design of the headstock allows a precise alignment of strings from the machines heads down to the bridge, eliminating so friction points on the nut, very typical of electric hollow body guitars and allowing to have an instrument that remains tuned and with excellent sustain characteristics. The "vintage" style of the pickups hides two very powerful and balanced humbuckers (made with Alnico 5), versatility of the instrument is increased by a push-push potentiometer to split the humbuckers. A Clip on Tuner respecting current and future regulations, in a nice packaging that can be hooked. To support a wide variety of players, EKO launches a Clip Tuner that features different modes: chromatic, guitar, bass, ukulele, violin. The battery compartment cover, hiding a typical button cell, can additional be locked by a little screw, making it safer against the risk of ingestion by children, more and more countries are increasing safety of such devices indeed. Small, very readable display that, in addition to the normal backlighting, becomes totally green once the pitch of the note has been reached. A Capo for all applications, in a nice packaging that can be hooked. The two sides of the capo have each a different length and radius. The radius is referred to the radius of the fingerboard of the guitar, this is indeed a very important detail to consider when buying a capo. A Capo without radius, once the central strings are pressed, tends to not firmly push on the most external strings: this does not happen with EKO AAC All Around Capo. The "longer" side of the capo has no radius and is thus suitable for wider necks, for classical guitars fingerboards and for some twelve string guitars that have "straight" fingerboards; the "shorter" side of the capo comes with a radius suitable for electric and acoustic guitars, in addition to some twelve string guitars having a radius on the fingerboard. Designed in Italy, a smart accessory to have your picks always at your fingertips. Once it is placed on the guitar in the most preferred position, and it is very easy and simple to change location, the picks can simply be placed over the Picks Keeper without any pressure, they will immediately stick to the jelly surface. The gel is safe for all instruments, "wood friendly", as long as you do not leave it attached for very long periods and exposed to direct sunlight, which, as with any material, would affect the instrument. Using the plastic foil it is supplied with, for covering it again, will allow to use the Picks Keeper multiple times; in case of a loss of grip, it is enough to clean it using tepid water and let it dry in the air (holding it with two fingers on the edge) to regain the initial stickiness. Each package includes a small circular gel pad, suitable for guitars, and a rectangular gel pad to use on amplifiers or other surfaces. 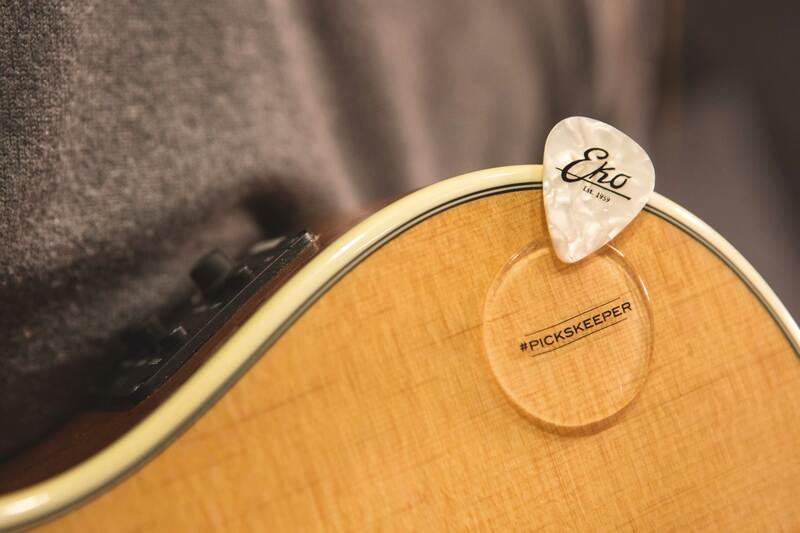 The Picks Keeper, despite of its name can be suitable for holding other kind of items, like tuners, bottlenecks and other accessories to keep at hand by applying the gel pads on amplifiers or sheet music stands for instance.